Francis Bacon. Study for a Portrait of Van Gogh. The Spotlight Series. Home / Shop / Books / Francis Bacon. Study for a Portrait of Van Gogh. The Spotlight Series. 4to. Five panel folding card. Essay by Bruce Bernard. 7 colour and 7 b/w illusts. Central horizontal crease. Publisher: Arts Council of Great Britain. 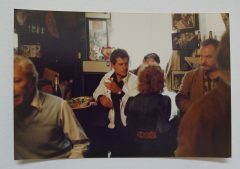 Colour photograph of John Edwards in the Colony Room. circa 1980. 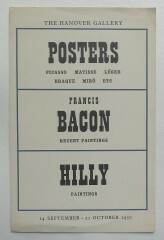 Posters: Picasso, Matisse, Léger, Braque, Miró etc. Francis Bacon Recent Paintings. Hilly Paintings. The Hanover Gallery, London 14 September-21 October 1950. 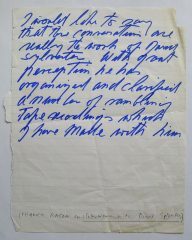 An autograph note by Francis Bacon. SYLVESTER, DAVID. 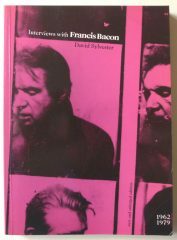 Interviews with Francis Bacon. New and enlarged edition. 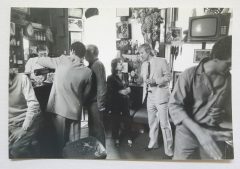 B/w photograph of Francis Bacon (partially obscured and John Edwards?) in the Colony Room. circa 1975. 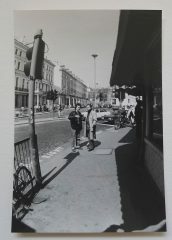 B/w photograph of Francis Bacon and a companion in South Kensington, circa 1970. Probably taken by Edwards.